I learned how to make sweet rolls for my family. For special days like holidays I liked to make something different for breakfast. Generally, my husband always wanted for breakfast soft fried eggs, some meat and toast. He did sometimes like eggs with biscuits and sausage gravy. For special days and occasionally on regular week days I liked to make sweet rolls for my children. They really got excited when they found out I was making special rolls. My first were pecan rolls and they loved them. 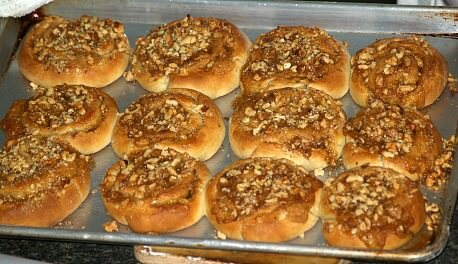 As you learn how to make sweet rolls you will find many recipes with pecans, walnuts, almonds and other nuts. Although I favor ones made with yeast, they can also contain baking powder or baking soda as leavening. These breakfast rolls can include various spices and many candied fruits. You have the option of adding a glaze, frosting or making them plain. All are delicious! The “key” is to prepare them to please your family and those for whom you are baking them. Learn how to make sweet rolls with walnuts. Combine water, milk and 1/3 cup of butter in saucepan. Heat until butter melts stirring occasionally; cool to 120F degrees. Combine 2 CUPS of flour, baking powder and salt in large bowl. Add 2 tablespoons sugar and yeast to the bowl. With electric mixer gradually beat in the liquid. Add egg and beat on high speed for 2 minutes. Stir in enough of the remaining 3/4 CUP of flour to make soft dough. Turn dough onto floured surface; knead 4 to5 times. Roll dough to rectangle 15X10 inches. COMBINE FILLING in small bowl beat 1/3 cup butter and brown sugar. Beat on medium speed until creamy; spread HALF over the dough. Sprinkle ½ CUP walnuts over the top’ roll up from long side like jelly roll. Cut into 1 inch slices; place on greased baking sheet pressing down to ½ inch. Spread remaining sugar mixture over each roll; top with remaining walnuts. Cover and let rise in warm place 1 hour or until doubled in bulk. Bake 10 to 12 minutes until golden brown; serve immediately. 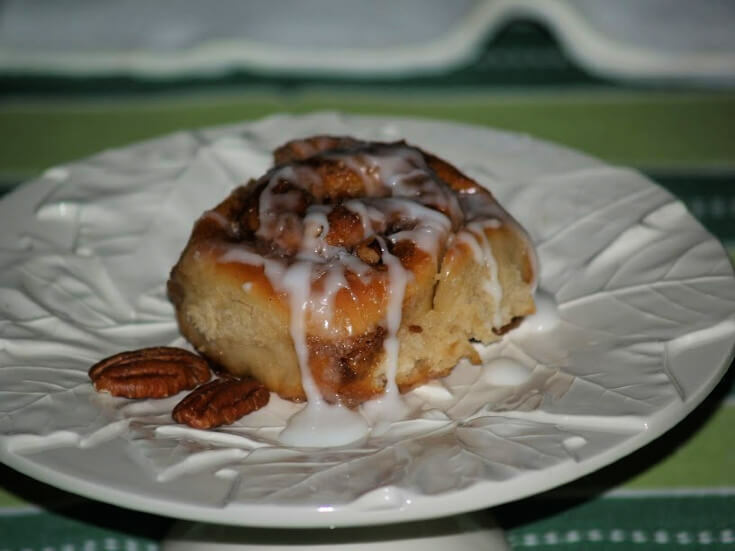 Learn how to make sweet rolls with raisins and pecans. Combine milk, sugar, salt and oil in saucepan. Heat milk mixture to about 115F degrees. Place milk mixture in a large mixing bowl. Add yeast mixture to the flour mixture. Stir in the yeast/ milk mixture as much flour as you can. Shape dough into a ball and place in greased bowl turning to coat. Cover bowl and let rest 10 minutes; GREASE 13 x 9 x 2 inch baking pan. Combine brown sugar, cinnamon, raisins and nuts; set aside. Roll dough on lightly floured surface to 18X12 inch rectangle. Spread the melted butter over the dough; sprinkle raisin mixture over top. Roll up “jelly roll” style starting at the long side; seal edge. Slice roll into 12 pieces; place cut side down into prepared pan. Cover and let rise until doubled about 30 minutes. Bake rolls about 25 to 30 minutes; cool slightly. Remove from muffin tins and place on rack. Combine powdered sugar, vanilla and enough water to drizzle. Drizzle icing over top of rolls; makes 12. Learn how to make sweet rolls that are the best orange rolls with a sour cream glaze. Dissolve yeast in warm water in large mixing bowl. Beat in ¼ cup sugar, salt, eggs, sour cream and 6 TABLESPOONS of the melted butter. Gradually add 2 cups flour and beat until smooth; turn out onto floured surface. Knead remaining flour into dough; cover and let rise in warm place until doubled about 2 hours. Punch dough down and knead on floured surface about 15 times; divide dough in half. Roll each half to a 12 inch circle; combine ¾ cup sugar and orange peel. Brush dough with melted butter and sprinkle with half of the sugar mixture. Cut dough into 12 wedges and roll each up into crescent shape; repeat with other half. Place rolls point side down in buttered 9X13 inch pan in 3 rows. Combine glaze ingredients in saucepan and bring to a boil. Boil glaze 3 minutes stirring constantly. Learn how to make sweet rolls for breakfast by preparing them days ahead. Combine hot water, salt, oil and sugar in large bowl; cool to 115F degrees. Soften yeast in warm water; add to cooled salt/ oil mixture. Beat in egg and half of flour with mixer; stir in enough flour to make soft dough. Place dough in lightly greased bowl and grease top with oil. Cover tightly with plastic wrap; refrigerate overnight (Will keep 4 -5 days). Let set at room temperature 30 minutes; roll dough out to ½ inch thick. Cut with biscuit cutter; fold each in half and pinch together to seal. Place on lightly greased baking sheet; let set in warm place 30 minutes. Bake 10 to 15 minutes; spoon orange topping over the rolls. Combine and mix cream, butter and orange juice. Add enough powdered sugar to make desired consistency. Learn how to make sweet rolls with chocolate. Combine melted chocolate, butter and ¼ CUP flour in small mixing bowl; beat well. Spread chocolate mixture on wax paper lined tray to 10X4 inch rectangle. Cover loosely with a piece of wax paper and chill until firm. Combine yeast and warm water in mixing bowl; let stand 5 minutes. Add to yeast mixture sugar, milk, egg, oil and salt. Gradually beat in enough of the 3 CUPS flour to make stiff dough. Cover dough and let rise 30 minutes. Roll out on a lightly floured surface to a 12 inch square. Place cold chocolate sheet in the middle of the square. Fold 2 uncovered sides of dough over the chocolate overlapping. Turn dough ¼ around; roll out again to 12 inch square; fold ends over as before. Repeat folding and rolling 1 more time; chill for 1 hour. Roll dough to a rectangle 15X9 inches; cut into 15 strips (1 Inch each). Place strips cut side down on ungreased baking sheets. Roll ends in to form “C”; chill for at least 30 minutes. Bake rolls 20 to 25 minutes; cool, frost and sprinkle with nuts. Best when eaten fresh; makes 15. Frosting: Combine 1 tablespoon butter with 1 cup sifted powdered sugar. Gradually add ¼ teaspoon vanilla and 1 ½ to 2 tablespoons milk until glaze consistency. Learn how to make sweet rolls with bananas and baking mix. Place 2 TEASPOONS brown sugar, 2 teaspoons BUTTER in each of 12 muffin tins. Place 3 pecan halves in each of the muffin tins; place in oven just to melt sugar and butter. Stir baking mix and bananas to soft dough; gently smooth into a ball. On lightly floured surface knead 5 times; roll into a rectangle 15X9 inches. Spread with 2 TABLESPOONS butter and sprinkle with ¼ CUP brown sugar. Roll up beginning at long side; pinch edges to seal; cut into 12 slices (1 ¼ inches). Bake 10 minutes; immediately invert on serving tray or another baking sheet. Learn how to make sweet rolls using premixed baking mix. Sift flour, baking powder and salt; cut in butter. Stirring with a fork add enough milk to form a soft dough. Turn out onto lightly floured surface; roll into rectangle about ¼ inch thickness. Drain plums reserving the juice; cut plums into large pieces. Cover dough with the plum pieces; roll up as a jelly roll; moisten edges to seal. Cut into 1 ½ inch slices; place cut side down in greased 9X13 inch baking pan. TO MAKE SYRUP measure reserved plum juice; add enough water to make 2 cups. Combine sugar, flour and salt in saucepan; gradually stir in plum juice/ water mixture. Bring mixture to a boil; boil 3 minutes stirring one or two times. Remove from heat and stir in butter and lemon juice; pour while hot over the rolls. Bake for 30 to 35 minutes basting 1 or 2 times during baking; serve warm. Serve on plate with utensils due to stickiness. 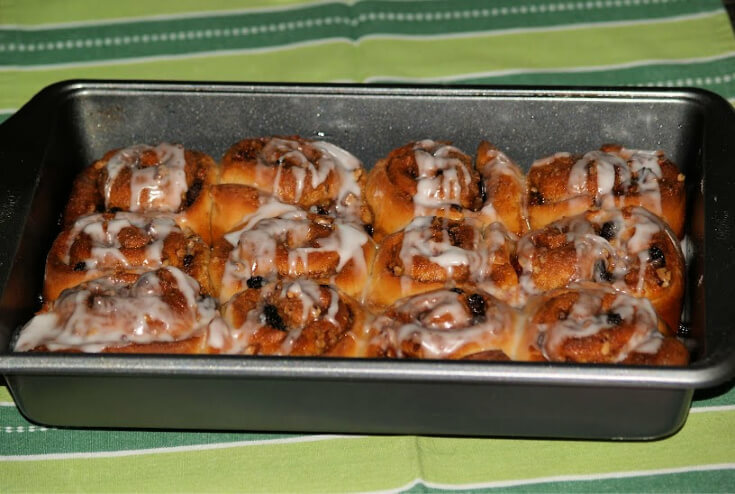 Learn how to make sweet rolls with commercial mincemeat. Prepare roll mix according to directions on package. Let rise until double in bulk; shape into 16 balls (About 2 inches in diameter). Place in greased muffin cups; with greased scissors cut rolls in half and then in quarters. NOTE: Cut almost to the bottom but not through. Brush rolls with melted butter; let rise until doubled in bulk. Place 1 tablespoon of mincemeat on top of each roll; bake 15 minutes or until golden. Combine powdered sugar, lemon and milk; spread on warm rolls and serve. Learn how to make sweet rolls with pecans and butterscotch flavor. 1 Package active dry yeast. Melt 2 TABLESPOONS butter in each of 2 (8 Or 9) inch round layer pans. Sprinkle each pan with ¼ CUP brown sugar and ¼ CUP pecan halves. In a large mixing bowl dissolve yeast in the warm water. Add 1 1/3 CUPS of the flour and remaining ingredients. On low speed of mixer blend 1 minutes scraping sides of bowl. Increase speed to high and beat for 2 minutes scraping bowl constantly. By hand stir in remaining 1 CUP flour; divide batter evenly and drop into prepared pans. Let rise in a warm place for 50 minutes (Dough will not double). PREHEAT OVEN to 350F degrees; bake for 25 to 30 minutes or until golden. Immediately invert pans onto serving plates; let syrup drizzle from pan onto rounds. Cut rolls and serve warm. Learn how to make sweet rolls which are not too sweet. They are also good with a glaze drizzled over them. *NOTE: Crushed orange: Peel all the skin and white pulp from the orange segments. Cut segments into tiny pieces to measure ½ cup. Combine orange coloring, orange extract, poppy seeds and eggs with milk in mixing bowl. Mix together on low speed of mixer; add dry ingredients blending into liquid on low. Increase speed to medium and mix for 15 minutes; cover and let stand for 15 minutes. Divide into 36 equal pieces and shape into round balls; place on greased baking sheets. NOTE: Use cookie sheet and place balls barely touching. Cover and let rise until double in bulk; PREHEAT OVEN TO 400F degrees. Bake 12 to 15 minutes until golden brown; makes 36.